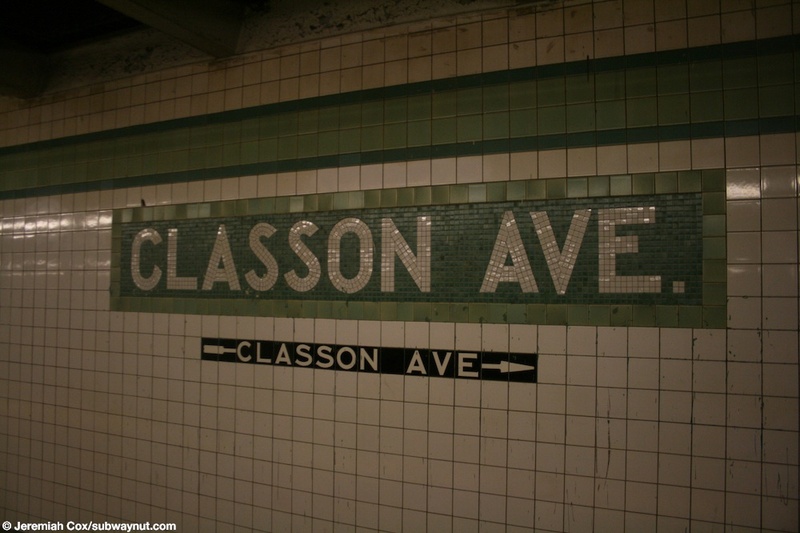 Classon Avenue is a two track side platform G station although there is enough room between the two tracks for a center track that was never added that wouldn't platform at the station, and bypass it. 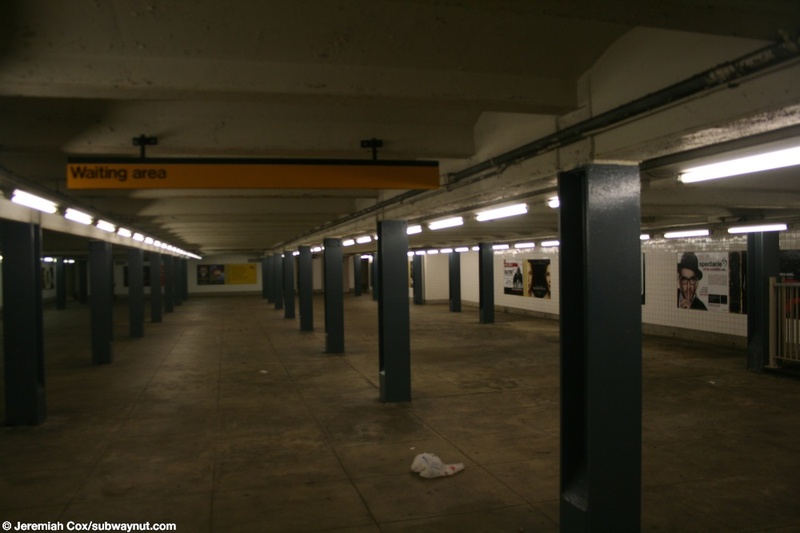 This means that the mezzanine is slightly wider than at other G stations. 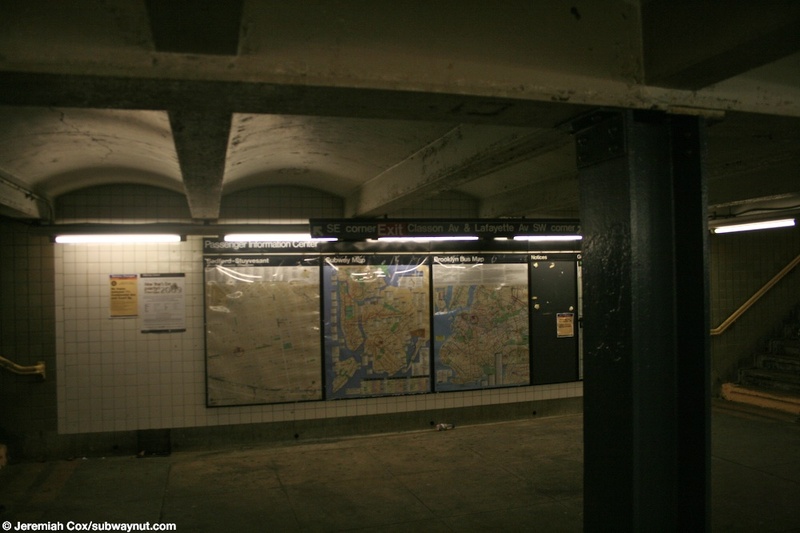 Currently the stations only open exit is right in the middle of the mezzanine. 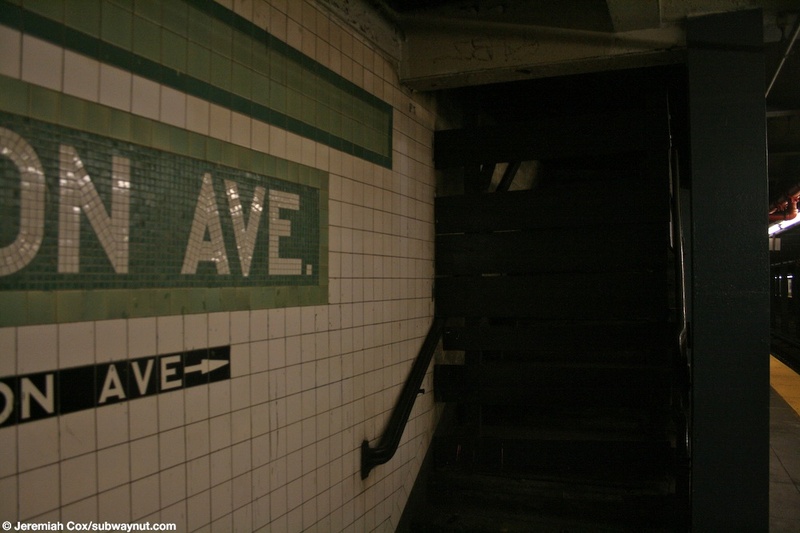 It has three staircases out to the street from it to three of the four corners of Classon Avenue and Lafayette Avenue. Only the northern half of the former full-length mezzanine exists. 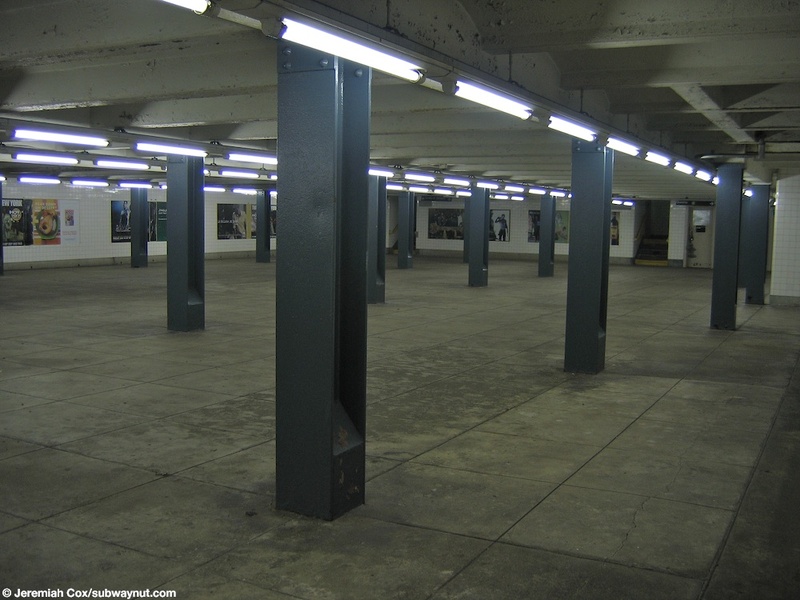 Boarded up staircases and a fence that closes up a large area of darkness are the evidence of the former southern half of a full-length mezzanine. It doesn't look like it is used for anything new. (classong1) A view down at the provision for a center bypass track that can be added at Classon Ave, all part of the IND second system. 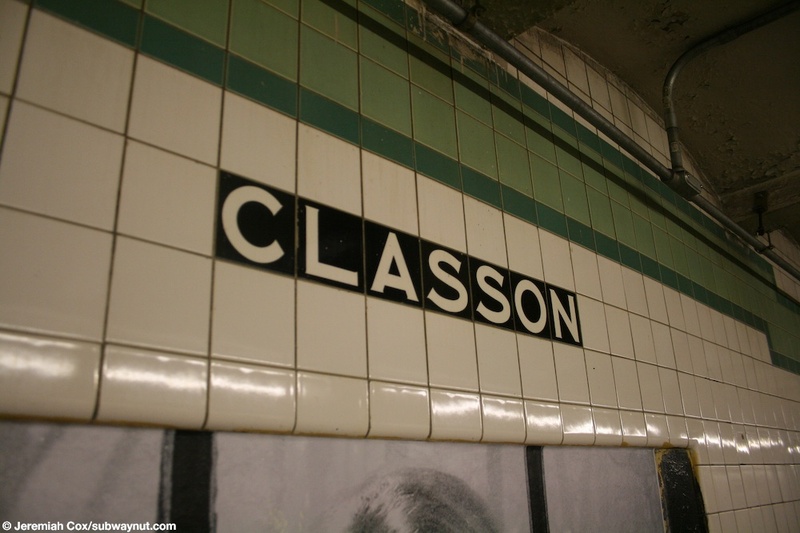 5 October, 2003 (classong2) A Classon Av name tablet. 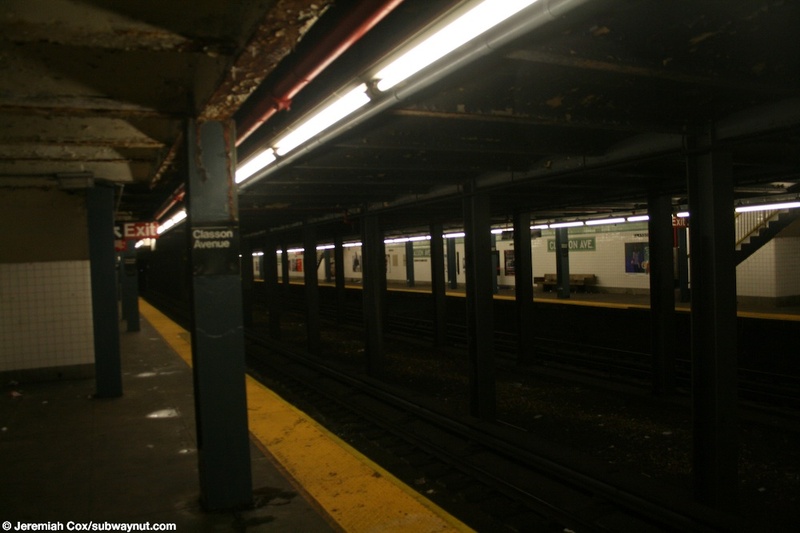 29 December, 2004 (classong3) Looking across to the opposite side platform at Classon Av. 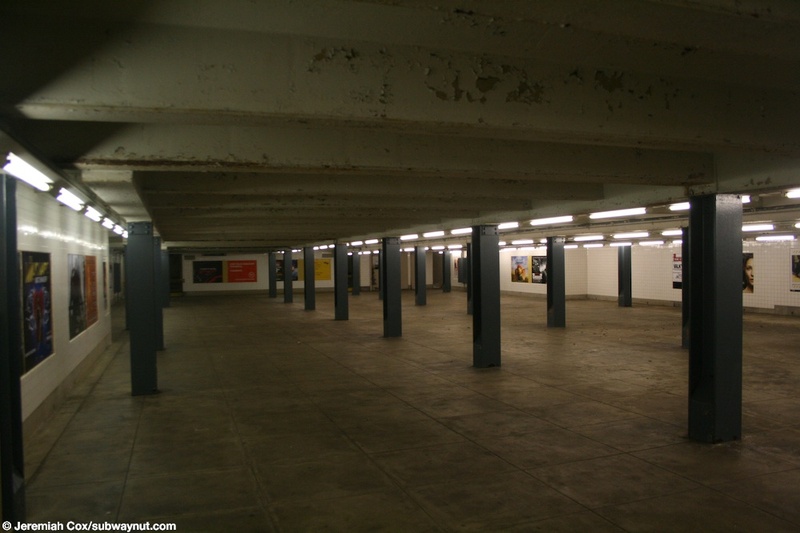 29 December, 2004 (classong4) A view of a portion of the mezzanine that is still open at Classon Av. 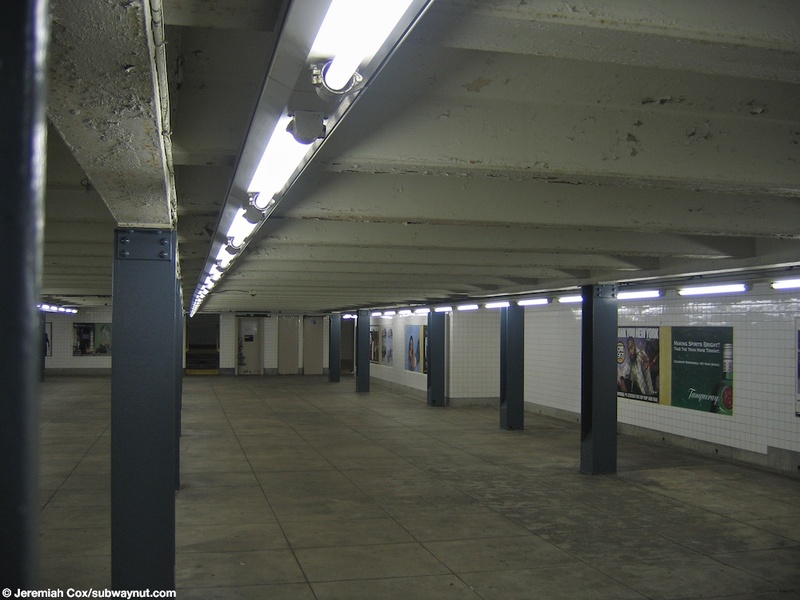 (classong5) Another view of the mezzanine at Classon Av. 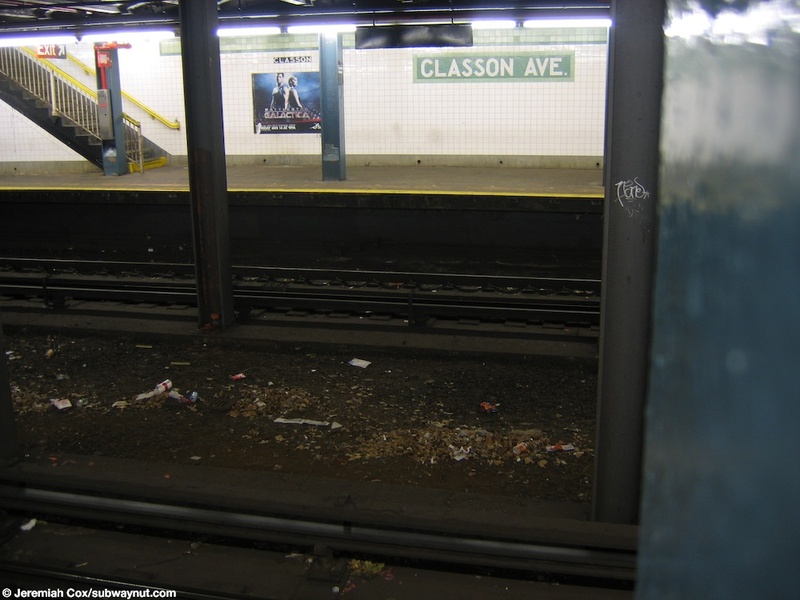 29 December, 2004 (classong6) The back of a Smith 9th St-bound G train stopped at Classon Av. 29 December, 2004 (classong7) Classon text beneath the green trim at Classon Avenue. 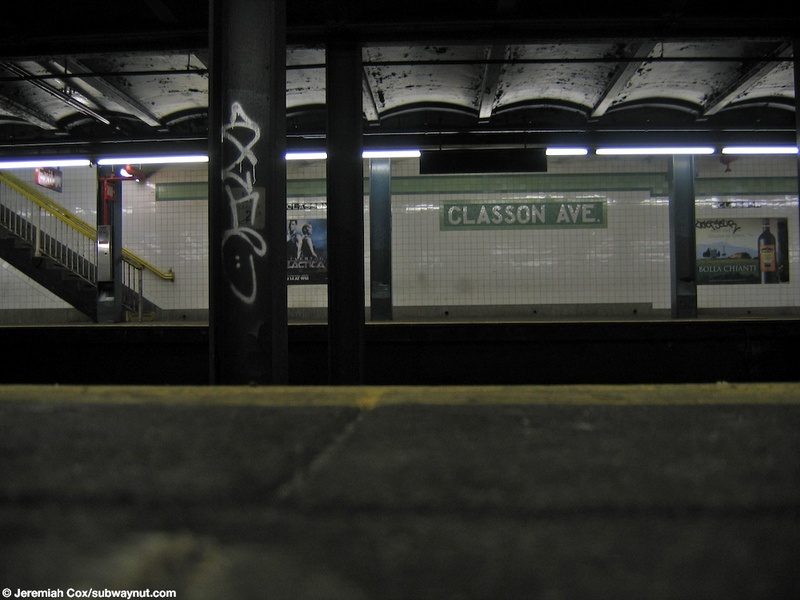 22 December, 2008 (classong8) Looking down the Smith 9th St-bound platform at Classon Avenue with a sign for the exit to Classon Av & Lafayette Av visible. It is the only exit currently open. 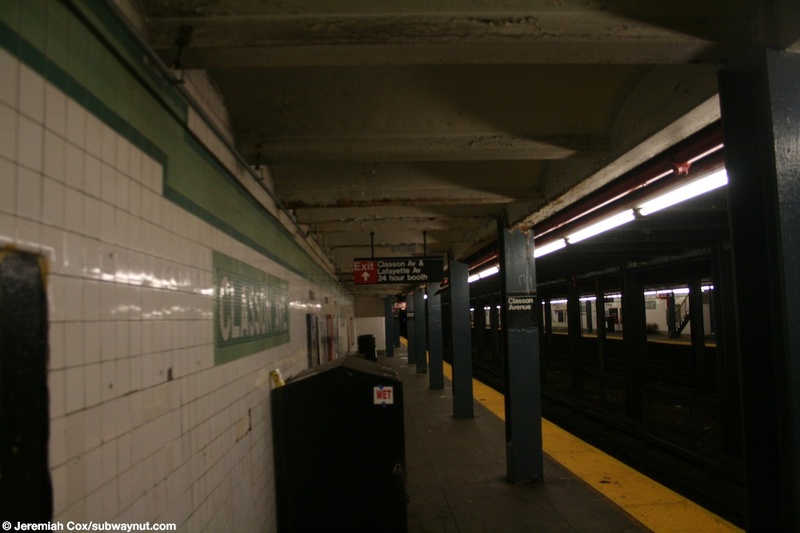 (classong9) Looking across to the Queens-bound platform at Classon Avenue, the empty space where a middle track could be added is visible. 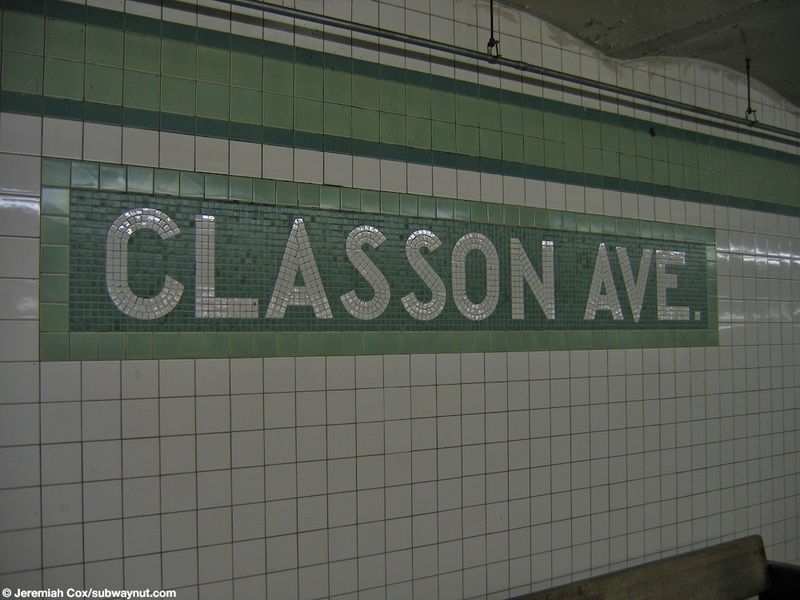 22 December, 2008 (classong10) A Classon Ave name tablet with exit tiling for the Classon Ave exit beneath it. 22 December, 2008 (classong11) A boarded up staircase to the now closed northern half of the mezzanine at Classon Avenue from a platform. 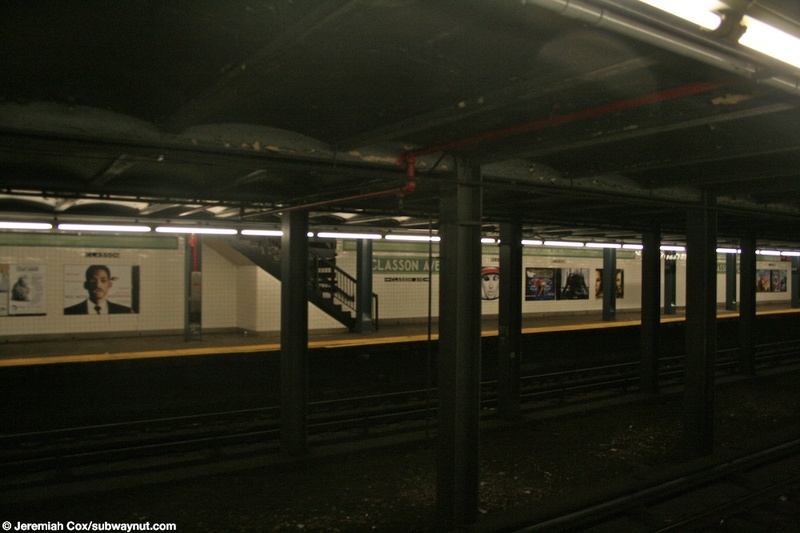 22 December, 2008 (classong12) A final view down the Smith 9th St-bound platform at Classon Avenue. 22 December, 2008 (classong14) Another view down the long northern half of the mezzanine at Classon Avenue. A sign says waiting area so passengers can wait there in view of the token booth, there is no bench of any kind. 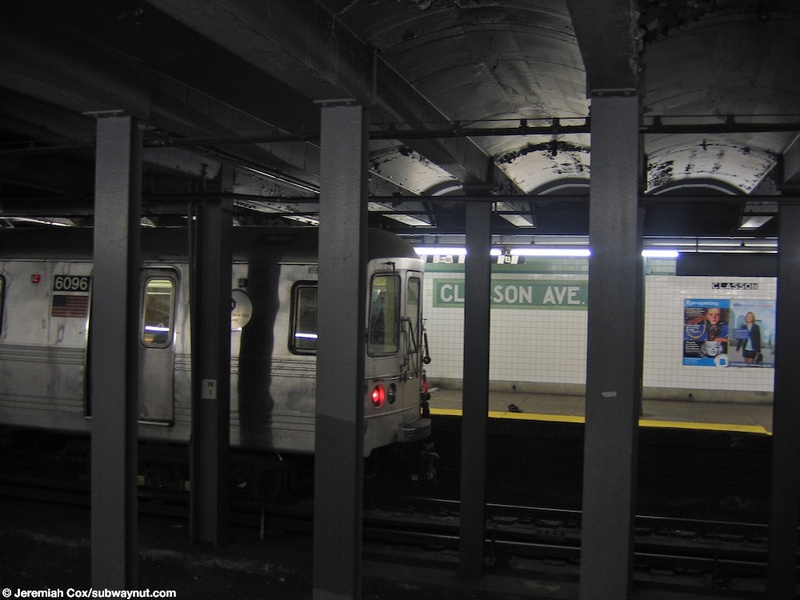 22 December, 2008 (classong15) Two staircases out of the subway to the SE and SW corners of Classon Avenue and Lafayette Avenue. 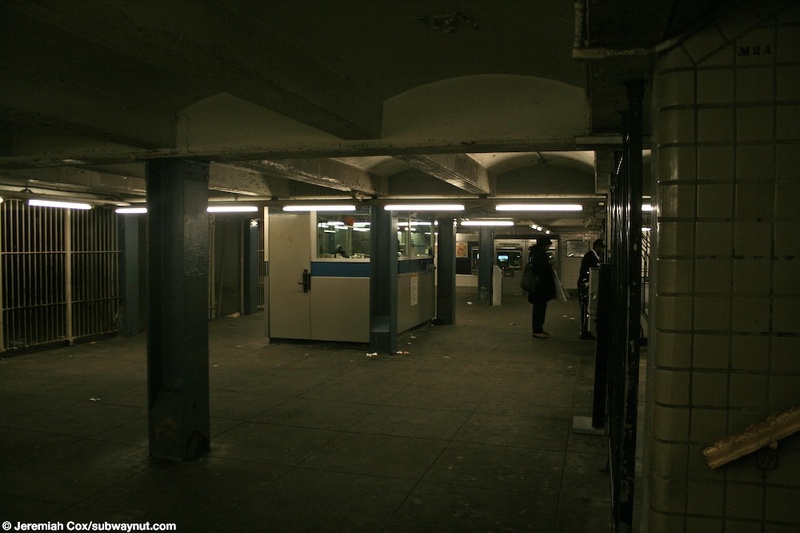 22 December, 2008 (classong16) A view of the token booth and fare control area at Classon Avenue, with the fence visible that has blocked off the northern half of the mezzanine.